Welcome to Henry's Farm website! We’ve got a new CSA Work-Share Program! And a new 20% CSA Junior Citizen Discount! Go to this online scheduling app to sign up for 2 work sessions. Work sessions are available each Monday and Wednesday in June, and the first two Mondays and Wednesdays in July. You can choose to work in the morning (7-11am) or in the evening (4-8pm). I’ve limited the number of helpers to 4 per work session, so the sooner you sign up, the more choices you’ll have to pick from. If none of these days or times work for you, please click on “Cannot Attend,” and then leave a comment telling me when you could work and we'll work out a schedule for you. Come to the farm ready to work. I will send you a reminder a week in advance of your work dates. In that email, I will give you directions to the farm and give you some idea of the type of work I think we will be doing, plus any special gear you might need (gloves, boots, etc.). I will supply any tools you will need. Most of the work will be weeding jobs. That could mean working on your hands and knees with a hand hoe, standing up with a long-handled hoe or anything in between. Other possible jobs could be mulching, harvesting dry onions or garlic (1st or 2nd week of July), or planting seeds. Please come expecting to get dirty and sweaty, and dress accordingly. Farming is hard work, but you can set your own pace and work to your own ability and potential. If you find that a job is too difficult, or hurts your back or knees, we'll find you another job. I always say that on a family farm there is a job for everybody, regardless of age, strength, or ability. Children are more than welcome, but they do need to be well-behaved and able to follow directions. The same applies to pets. If you plan on bringing children or pets, please discuss it with me first. In exchange for your work, you will get $45 off the cost of your share. For newly joining members, I will simply have you sign up and pay the Work Share Member price. Members who have already paid the full price (renewing members) can choose from three options. Option 1: Refund If you paid by check, I’ll send you a $45 refund check. If you paid by credit card, I’ll refund $45 to your credit card account. Option 2: Extra produce At the end of the season, you can order $45 worth of produce to pick up at the last CSA distribution. Although every year is different, normally I’ll have storage roots such as garlic, potatoes, radishes, turnips, sweet potatoes, carrots and parsnips and often popcorn, dry beans and cornmeal as well. Option 3: Discount Get a $45 discount on next year’s CSA share price. First of all, I hope it will help ease a perennial labor shortage problem we have at garlic harvest time each year. The “Great Garlic Harvest” occurs right around the 4th of July, when we harvest some 30,000 garlic plants and then sort, tie, and hang them from the barn rafters to dry. To get all that work done in one week, we put all other farm jobs on hold, so no weeding, planting, mulching, trellising, or other crucial farm work gets done during that week. Even if we enter the week of the Great Garlic Harvest completely caught up on our work (and usually we are already starting to fall behind), the Great Garlic Harvest always puts us in a hole that we don’t get dug back out of until September. I’m hoping that if enough of you sign up for the Work Share Program, the whole season will go more smoothly. Secondly, I hope that this program will make the CSA more economically feasible for younger families or families on a fixed income. Although my CSA is by far the least expensive one I’ve seen anywhere, I do sometimes hear, “We just can’t afford it this year.” I firmly believe that Good Food--food that tastes good, is good for you and is grown in a manner that is good for the environment--is not a luxury, but a necessity, and I hope this program will help make Good Food available to everyone. Finally, I hope that the Work Share Program will deepen and strengthen ties between the farm, the food, and you, the eaters. Nothing can deepen your understanding and appreciation of Nature, and farming with nature, as much as doing the work that produces the food that you eat. When a bunch of large, fall carrots shows up in your share in October, you will remember that hour or two you spent in the hot sun weeding them when they were just spindly, one-inch tall seedlings. When you slice up a cucumber, you’ll remember placing single seeds in the furrow two months earlier. And those carrots and cucumbers and everything else will taste better because of it. Junior Citizens receive a full 20% off the price of the CSA! This is a huge discount (much larger than Senior Citizen discounts), and brings your CSA share cost to only about $13.60 per week! What are the goals of the Junior Citizen Discount Program? We offer Junior Citizens such a large discount because we want to make sure that Good Food — food that tastes good, is good for you, and is raised in a way that is good for the environment — is affordable to everybody. And we also want infants and toddlers to eat the safest, healthiest, most nutrient-dense food available. It's just wrong that only well-off people are able to eat Good Food, and the Junior Citizen discount helps right that wrong. Can I combine the Junior Citizen Discount with the Work-Share Program? Yes! If you are a qualified Junior Citizen and also work on the farm twice during the season, you pay only $311 for the full 26 weeks of produce, which is a super-affordable $11.96/week for the most delicious, nutritious vegetables you've ever had! If you quality for the Junior Citizen Discount, please click on Join Now below, and then select the Junior Citizen price on the Member Type drop-down menu. Our specialty is diversity, with over 650 varieties of vegetables in each year’s seed order. This great diversity means that the fields mimic nature, making them less attractive to potential pests than all-you-can-eat monoculture fields. Henry selects which varieties to grow based on their taste and nutrition--not the industrial growers’ values of uniformity, transportability and shelf-life. And he constantly experiments with planting new crops as he strives to adapt to our changed climate, such as replacing cool-weather cilantro with heat-loving papalo and pipicha. Other ongoing adaptations to climate change include solar panels to generate electricity, an Allis Chalmers G tractor converted from fossil fuel to battery (solar) power, a rice paddy that collects all the vegetable wash water and rainwater from the packing shed roof, no-till and lo-till practices, perennial polycultures in areas prone to flooding, and terracing and catchments to deal with excessive rainfall. Climate change is THE challenge of our time, and we are in this struggle together. Thank you for supporting our farm and our efforts to produce good food no matter what! 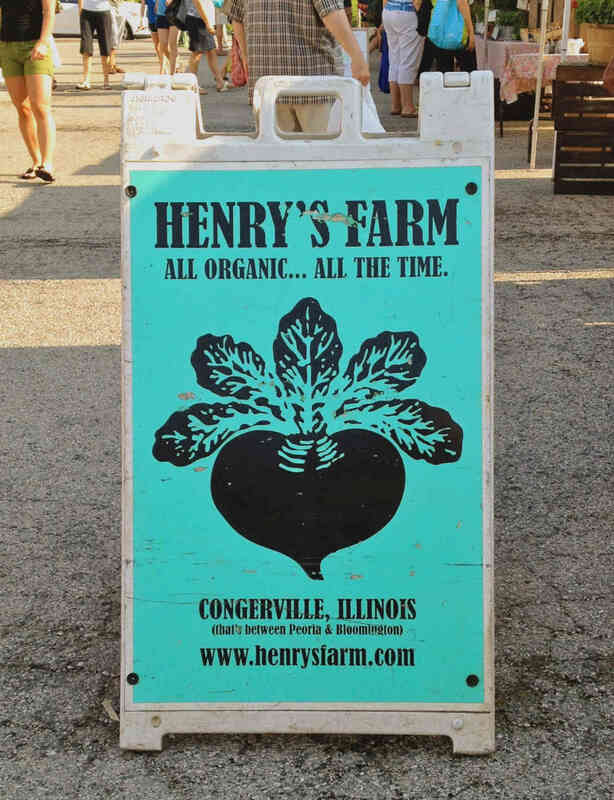 Henry’s Farm is a sustainable, multi-generational, small-scale, labor-intensive farming operation in Central Illinois. It is hidden deep in the rolling hills and fertile bottom land of the Mackinaw River Valley, where periodic flooding over thousands of years left deposits of nutrient-rich silt, creating black topsoil so deep we have never seen the bottom of it. This is not just a farm owned by a family, but worked by a family — three generations of the Brockman family — from Henry’s parents, to his wife Hiroko and their three children, to assorted brothers and sisters and cousins and nieces. In addition, we have wonderful farmhands and apprentices. 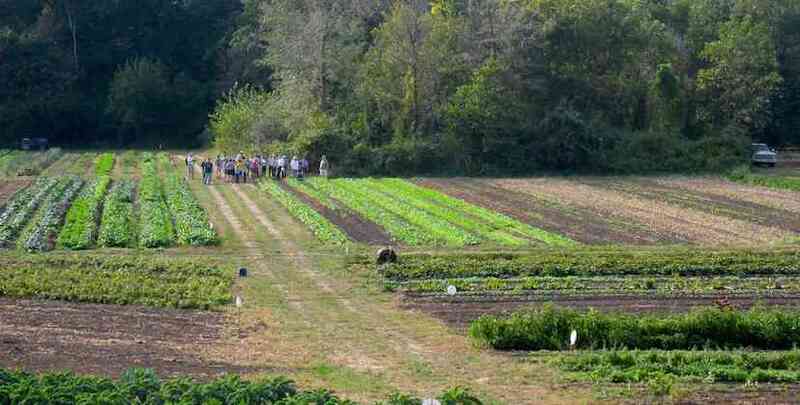 Each year, about half of Henry's 25 acres is used to grow vegetables, and half is fallow. Half of both the bottomland fields and the upper fields is allowed to rest and regenerate for two years, while the other half produces vegetables. The fallow land is planted in an alfalfa hay mixture, which is cut a few times a year and used for mulch and for the animals. More importantly, legumes in the hay mix put nitrogen back into the soil, and the fallow years allow the soil microbes and fungi to re-establish themselves, and create a healthy, living (and giving) soil. Every harvest day, wave after wave of freshly picked produce makes its way by the pick-up-load from the fields to the packing shed. There, everything is washed, sorted, boxed, bagged, and loaded on the big truck for delivery to our local CSA members or to our Evanston Market customers. Henry loves variety, and grows vegetables from all over the world including heirloom varieties. An "heirloom” vegetable is generally described as a variety that has a long history of human use. American heirlooms generally can be traced to crops grown by Native Americans or seeds that immigrants brought with them to the U.S. and then grew year after year in their backyards, collecting seeds each year to plant the next. If you want a tomato to taste like a tomato, you have to go back to the older hybrids or the heirloom varieties, which are not uniform in size or shape or color, not very transportable, and not long-lasting on the shelf. Instead you get flavor, flavor, flavor! If you’re interested in growing some heirloom vegetables, a good source SeedSavers Exchange. Click on a vegetable type to see the cultivars we grew in 2012. We experiment with a few new cultivars every year, but the number of cultivars we grow holds steady. FYI an "OG" after a name means organic seed: We buy it whenever possible. Explore a bit and you’ll find we grew 89 tomato, 49 pepper, and 23 corn cultivars. You’ll eat with the seasons, and get the most delicious and nutritious produce possible! Eating with the seasons means eating what is happiest…when it is happiest. And I honestly think that makes you and your body the happiest, too. Although there is a lot of talk about eating with the seasons, unless you grow your own food in your own backyard it is pretty much impossible to do. It’s oxymoronic, but these days you can even get locally-grow out-of-season produce, thanks to season extension technology, much of which uses lots of electricity from coal-fired power plants, plastics and fossil fuel. But our motto at Henry’s Farm is “Make Our Farm Your Backyard Garden.” Just like you would go out to your garden and pick whatever is ripe and ready, we do the same, just on a larger scale. As a member of Henry’s CSA, you will eat what Nature wants you to eat that week. Each week we pick what Nature (the soil, the weather, the ecological web of organisms) did best at growing to maturity that week. Out of the 50 or so different crops that I harvest each week, you will get the 7 to 9 that are at their peak. I can usually get lettuce to grow even in August, but it is not very happy then. I still sell it at the farmers market because the customers want it even in the heat of summer, but you and I won’t eat lettuce then. Why bother, when the long, hot days of summer are heaven for tomatoes and cucumbers, and they taste like it, too. A tomato in October? It’s not very happy. It’s chilled, pining for sunlight and worn out from producing fruit through a long, long season. But a butternut squash? It holds within its shiny, laquered shell all that summer sun, now converted to sugars and Vitamin A, fiber and phytochemicals, bursting with flavor and nutrition. That’s what you and I will eat in October. As a CSA member, you will eat like I do-- truly with the seasons. And you don’t even have to work at it, don’t even have to think about it. Nature does the thinking for us, selecting what is best for us--as one of the threads in this Midwestern web of life--each week of the season. Every farming season is an adventure in growing and eating and living and as a CSA member, you will be an active participant in that adventure. You’ll be helping to save the world one delicious bite at a time! By joining my CSA, you become a fighter against the current high-consumption, high-waste civilization that is ravaging our planet. As consumers of food grown in a sustainable way, you are initiators of a circle of health that extends from you to the entire planet. Eating my highly nutritious food makes you healthier, and it also makes my farm healthier. And my healthy farm makes the larger ecosystem surrounding it healthier, and that makes our entire planet healthier. And it all starts with you and each forkful of food you eat. So, join the CSA—help save the world! 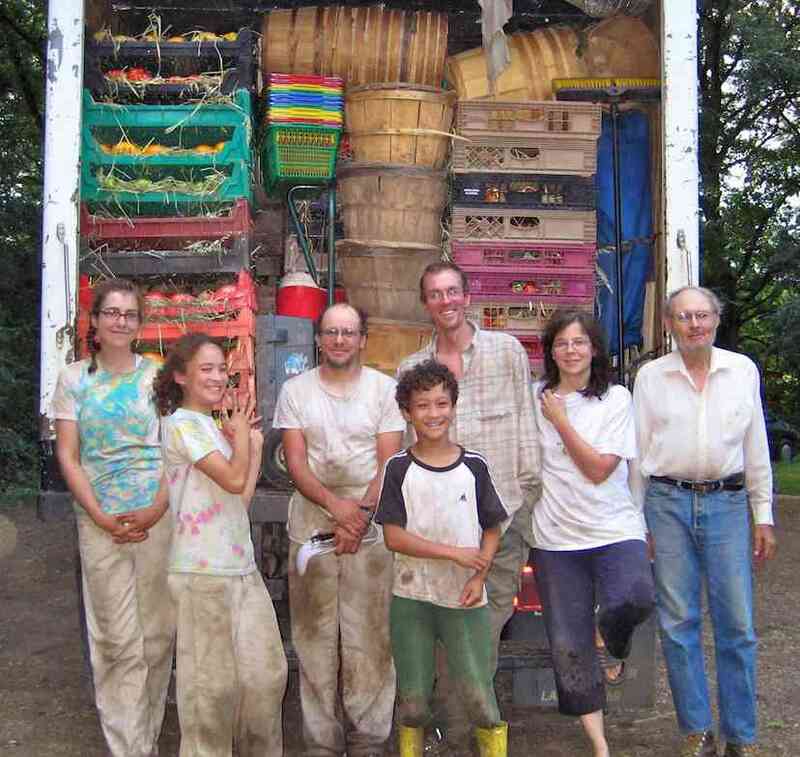 I can think of no better model for a sustainable farming system than an authentic CSA. The direct connection between me, the grower of the food, and you, the eaters of the food, allows me to be the best possible farmer. It makes the farm super-efficient and highly sustainable, in both economic and ecological senses. What is a good farmer? A good farmer is a person who raises Good Food. I define Good Food as food that tastes good, is good for you, and is raised in a manner that is good for the environment, and that is what I try to do. These three “goods” are all linked and interrelated. Only highly nutritious produce tastes delicious. The nutrients in produce are what give it flavor. In turn, highly nutritious food can only come from a healthy soil and healthy environment. That means that to grow delicious, nutritious food, I have to work with nature to protect the environment and ecology of my soil, my fields, my farm—and in the process leave this piece of land as healthy and productive as it was before I started farming it. By protecting and sustaining my farm, I am also doing my part in protecting and sustaining the larger environment surrounding the farm. I do not pollute the air or the water with toxic agrichemicals. I conserve energy and resources. I even combat rather than contribute to global warming by improving my soil (i.e., instead of releasing carbon into the atmosphere where it enhances the greenhouse effect, my crops pull CO2 out of the atmosphere and sequester carbon in the soil in the form of stored organic matter). I couldn’t do any of this without you. I can only farm the way that I do because people like you eat what I grow. So, join the CSA, and help make our world a better place. Thank you! It’s a great deal--the most reasonably-priced you’ll find! Not only are we the least expensive CSA around, but our 26-week season is one of the longest in the Midwest. Make sure to compare the per-week cost when comparing CSAs. At $445 for 26 weeks of produce ($16.75/week), you won’t find a more reasonably priced CSA anywhere. And I guarantee that you will get at least $16.75 worth of produce per week, averaged out over the entire season. I also guarantee that you will get 6-9 different vegetables each week. If you are already a frequent shopper at farmers markets, you know that most produce costs at least $2.50 to $3 per unit, so simple multiplication tells you that you will be getting well over $16.75-worth of produce each week. In the 16-year history of Henry’s CSA, the actual value of the produce in the share has always exceeded the price that the members paid. Not only are we low-priced to start out with, but then we give you more than what you pay for—far more. To give you some hard numbers, last year the real value of the weekly share averaged nearly $21. In other words, members paid $16.75 a week but received $21-worth of produce. For the 26-week price of $435, they received about $545 worth of produce. That’s $110 of free produce! Or to look at it another way, that’s like getting a 20% discount at the farmers market. The basic philosophy of the CSA model is that the farmer and the members are in it together. When times are good, the farmer shares the bounty with the members and when times are lean, the members tighten their belts along with the farmer. In my CSA, though, you will never have to tighten your belt. Since more than half of what I grow is produced for the farmers market rather than for the CSA, in bad times, I can always pull produce away from the market offerings to feed my CSA members instead. And since CSA members have already paid up, feeding you always comes first. While you won’t need to worry about lean times, you will definitely share in bountiful times. When each crop on the farm is at its peak productivity, I usually end up with more of it than I can possibly sell in a week. Rather than letting it go to waste, I pass that excess on to you, the CSA member. For example, when tomatoes peaked last year, each CSA member got 4 pounds of tomatoes! That’s covers half of the cost of that week’s share right there and there were still 5 other items in the share. The actual value of the share that week came to $26. And since a different crop is peaking almost every week on the farm, you will be sharing in the excess bounty of the farm almost every week, too. You can customize what vegetables you receive each week. I do this in a number of ways. First, I build choice into the weekly list of produce, often providing a choice of two or more different roots (e.g. 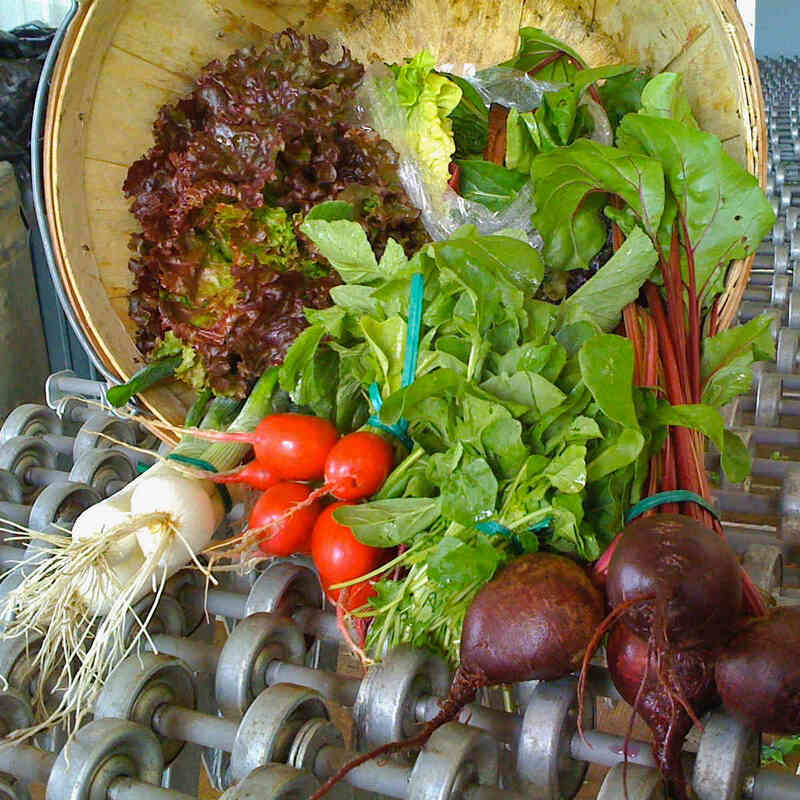 beets or carrots), herbs (parsley or dill), and/or greens (lettuce or mesclun salad mix or arugula). In addition, downstate CSA members may use the Exchange Table, while Evanston CSA members have a generous substitution policy. If abundance is the up-side of the CSA model for the member, the upside for me as the farmer is that I get to decide what goes into the share each week. This makes my farm incredibly efficient. I can harvest crops exactly when they need to be harvested for best taste, best nutritional value, and best use of time and space. I can plan my harvests to avoid crop losses due to pests, weeds, and inclement weather. Basically, my ability to choose what to harvest, when, and how much makes my farm far more efficient, productive, and sustainable—and that is what makes it possible for me to give you $110-worth of free produce and still make a living at it. My ability to choose what to put in the share each week, of course, translates into a relative lack of choice in what you get in your share. This can be a problem for some people. I will come right out and say it: if you are a picky eater, then the CSA is not for you. That said, because in my CSA you pick out your own produce rather than picking up a pre-packaged box (as in most other CSAs), I have been able to come up with three methods to give you quite a lot of choice in what you get each week. First of all, I build choice into the weekly list of produce. Cilantro is a great example. It’s one of those things that people seem to either love or detest. So, nine times out of ten, if I put cilantro in the share, I pair it up with something else, usually dill. So on your share list that week, it will say “Choose cilantro or dill.” Almost every week of the season, the share list will contain several choices like this. All these choices means that you should never have to go home with a vegetable you dislike! The only real difference for Evanston Farmers Market members is how the pick-up works. Where: You will pick up your produce each Saturday of the season at my stand at the Evanston Farmer Market, in the far northwest corner of the market. What time: Anytime between 6 and 10 a.m.
B. We will pick your produce on Thursday and Friday. C. On Saturday, come to the market between 6 and 10 a.m. with the list of the items in your share that week from the Tuesday email. E. Walk through the stand picking up your items from the market display. In other words, it’s self-serve! The CSA produce will not be separated from the market produce and we won’t have your share pre-bagged for you. You will bring your own bag, pick out your produce from the display tables and bag up your own produce. See Prospective Member FAQ #13 and #14 for what to do if you can’t make it to the market one week. See #11 for details about the Substitution Policy. Fresh-picked seasonal vegetables for 26 weeks, starting the last Tuesday in May and ending the middle of November. The selection of produce varies from week to week (see typical shares below), but usually you‘ll fill a bag to overflowing with 7-9 types of vegetables at the peak of their flavor. Best taste and highest nutritional value. We grow only the best-tasting varieties and food scientists have shown that Taste = Nutrition! Convenient Weekly Pick-ups of vegetables picked that very day. The produce we hand-picked at 7 in the morning is in your hands that evening, after traveling 20 miles or less to reach your table. Pick-up locations are in Bloomington, Eureka, Morton, Peoria, and on Henry's Farm in Congerville. See location details below. Bloomington/Normal: Pick-ups are between 6:00 and 7:00pm at the Unitarian Church parking lot at 1613 East Emerson Street in Bloomington. Starting the first Tuesday in October they move indoors to the Vitesse Cycle Shop at 206 South Linden, Normal and run from 6:30 to 7:30pm. Morton: Pick-ups are between 6 and 6:30pm. Central Peoria: pick-ups are between 4:30 and 5:30pm. Near Peoria Heights: pick-ups are between 5:30pm and 6:30pm. Congerville (on-farm): Pick-ups are after 3pm at 432 Grimm Road. Didn't pick up your CSA share on Tuesday? You can pick it up on Wednesday at Henry's Farm. Be sure to text him before noon to let him know you'll be picking it up. 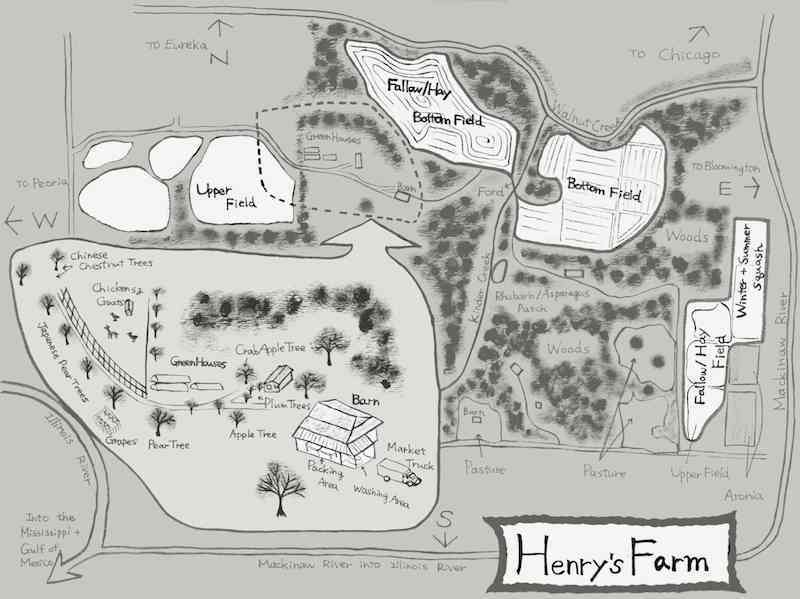 Here are detailed instructions on how to get to Henry's Farm and what to do when you arrive. Chicago Area: Pick-ups are between 6 and 10 a.m. in the Evanston Farmers Market (behind the Hilton Hotel on Maple Avenue) at Henry’s stand. Work two 4-hour sessions on the farm, learn about raising vegetables and reduce the cost of you CSA share by $45! For twentysomethings out on their own buying their own groceries, or parents of a toddler up to 29 months of age. Once the growing season begins in earnest, my life is a whirlwind of activity with little space for returning phone calls. I do try to check my email once a week, so please email me. If you need an immediate response, call my cell phone: I give out my number to CSA members. This is a difficult question to answer. Weight is not really a good measure because in the spring when you are getting lettuce, spinach and other light things a whole bag full of produce might not weigh more than a couple pounds whereas in the late summer when you are getting heavy things like melons, sweet corn and tomatoes you might lug home as much as 10 pounds of produce. Volume is not really a good measure either, but generally you’ll be able to fit a weekly share easily into two plastic grocery bags and some weeks it will fit in one if you really work at it. The way I measure a weekly share is by value. When I decide what to give you each week, I make sure it comes to around $16.75 worth of produce (as of 2017) because that is what I am charging you for it. In reality, however, you almost always get more than $16.75 worth, because I think that you should get a better deal through the CSA than you would at a farmers market. A CSA member last year, for example, would have had to pay nearly 20% more if they would have bought all the produce in their share at the farmer’s market. And they were to have bought the same amount of all the vegetables in their share at the local Jewel or Kroger), they would have spent nearly twice as much – see FAQ #5 below. The best way to measure a share is to say how many people it can feed. Unfortunately, this too is a very difficult question to answer because people’s dietary and cooking habits are so varied. However, most CSA members find that a share is adequate to feed a family of four “omnivores” or a family of two vegetarians. That said, I have had a family of two consume a double share and I have had two families of four members each share a single share. It really comes down to two factors: how often (how many meals) you cook at home as opposed to eating out or eating prepared dishes and how many vegetables you include in your diet. Will the CSA entirely cover all my vegetables needs? Like the question above, the answer here is going to be different depending on your family’s dietary and cooking habits. However, for most families, I think the answer is no. You will probably find yourself buying a small amount of produce. There are a couple reasons for this. First of all, it is difficult for me to grow some of the staple crops in large enough amounts at low enough cost. Potatoes, onions, and garlic are good examples. If you use these in most of your meals throughout the year, you will probably have to supplement what you get through the CSA by buying them elsewhere. That said, I am working on increasing my production of these crops so that I can cover more of the demand through the CSA. At the end of the season, you can tell me how I did and I will continue to produce more if needed for future years. Second of all, I can only supply what is growing on my farm in that season. You are not going to get a tomato before late July no matter how much you or I want one. Personally, I hope that you won’t go out and buy a tomato before mine come into season. I encourage you to wait. If you are diligent about using and enjoying the produce in your share each week, you won’t even miss those tomatoes until it is time for them. And when that time comes, they will taste so much better for having waited for them. So, although you might be tempted to buy produce out of season, my advice is to resist that temptation and really get into the act of eating seasonally. Another reason you may buy supplementary produce is that you don’t get enough of some item in your share to make a dish you wanted to prepare. You wanted to make borscht (beet soup), for instance, but there aren’t enough beets in your share that week to make a big enough batch to feed the whole family. If you really have to have borscht that week, you are going to have to get more beets elsewhere. But please remember, belonging to a CSA is all about flexibility. The CSA members who rejoin year after year are those who learn to roll with the seasons and roll with the share offering. If there are enough beets for borscht, they make borscht. If there aren’t, they make a cold beet salad with raisins and walnuts. Or they put those beets in the refrigerator until the next time beets are in the share and then have enough for a nice big batch of soup. As you learn to be flexible and adaptable in your meal plans and eating habits, and learn how to prepare and eat what you have when you have it, you will find that you are buying less and less outside of what you receive in the CSA. Finally, you may find that you just eat more produce in a week that what the CSA share provides. Well, congratulations! That means you have a very healthy diet, are skilled and versatile cooks, and eat most meals at home as a family. Unfortunately, you are the exception and I have to tailor the size of the CSA share to what a normal American family can consume in a week. The most common reason I get for members not rejoining my CSA is that there is too much in the share and they wasted too much of it. If you are sharing your share with another family, next year please purchase your own share. If you are already a single family member, then please get a double share. I’ll offer you a discount on the second share. I love to encourage good eaters. How does the price of your produce compare to produce prices in the grocery store? Several times over the years, I have gone to the Jewel grocery store in Normal with a list of the produce that CSA members received from me that week and priced out how much it would have cost to buy the same items there. In the worst comparison, in a week when my share contained several things that are produced on a massive scale for the wholesale market and thus sold very cheaply--such as potatoes, onions, carrots, broccoli, etc.—you could have bought your share at the grocery store for about the same price. Every other time, the grocery store produce was more expensive, even twice the price of the CSA share at times. And remember, that is how much it would cost you to buy the factory-farmed, chemically-grown equivalents of my organic produce. So, in other words, produce that was raised with chemicals, picked days if not weeks ago and shipped across the country or (more and more) around the world—produce with little nutritional value and less flavor--costs more than organic produce bursting with flavor and nutrition that was raised locally with love and care and picked that morning. Go figure. Why join the CSA rather than just shop at a farmers market? Waste: There is essentially no waste of produce with the CSA. If I have 200 members in the CSA, I pick 200 bunches of beets and every one of those bunches is not only already paid for but every one of them will end up on a member’s dinner table. With the farmers market, I never know how many beets I will sell in a given week. If one week I underestimate demand and underpick, I lose money and produce that could have been sold goes to waste in the field. If the next week I overestimate demand, I’ve wasted time, labor and resources harvesting, washing, packing and hauling the produce unnecessarily and in the worst cases, end up having to throw extras away. This does not happen with the CSA. Efficient management of the farm. This is perhaps where I as the farmer get the greatest value from the CSA. The fact that I as the farmer am able to decide each week what to harvest for the CSA makes my farm incredibly more efficient. It gives me the latitude to harvest crops exactly when they need to be harvested for best taste, best nutritional value, and best use of time and space. I can tailor my harvests to avoid crop losses due to pests, weeds, and inclement weather. The result is that little goes to waste and the farm is more sustainable and more environmentally friendly. You’ll eat better. Joining a CSA is the best way to ensure that you will eat better. Despite your best intentions, you may find that it is hard to stick to the diet that you know is best for you—a diet high in vitamins, minerals, fiber and whole foods and low in fat, sugar, salt and processed foods. Not only will picking up a complement of vegetables each week make you more likely to actually prepare and eat more vegetables, but you will find the fresh produce so beautiful and flavorful that you will want to eat more vegetables. Our handy recipe book and our many recipe ideas in the weekly email and on our website will make preparing the foods easier, too. It’s an adventure. Even if you shop regularly at a farmers market, you probably tend to pick up the things that you are already familiar with and know how to cook. In the CSA, you are going to receive some vegetables or varieties that you have never even heard of before. We will give you suggestions on how to prepare everything we give you, particularly things that are a little unusual. After a season in the CSA, you’ll probably realize that some of your favorite vegetables are things you didn’t even realize existed before, whether it is arugula, Aunt Ruby’s German Green heirloom tomatoes or purple sweet potatoes. It’s a great incentive to live better. Joining a CSA is kind of like joining a gym. If you are like most people, if you pay for a year membership at a gym you are going to end up exercising more regularly than if you had just made a general resolution to workout more. A CSA membership works the same way. You may resolve to eat better by shopping at the farmers market each Saturday, but chances are when push comes to shove you are going to end of missing a lot of farmers markets for a whole variety of reasons, many ones of convenience. When you join the CSA, you are locked in to picking up those vegetables every Tuesday no matter what, and you adjust your life accordingly. End result—you eat better and are healthier and happier. It’s the best way to support a local farmer. How does the Evanston Farmer’s Market CSA work? We will pick your produce on Thursday and Friday. On Saturday, come to the market between 6 and 10 a.m. with the list of the items in your share that week from the Tuesday email. Walk through the stand picking up your items from the market display. In other words, it’s self-serve! The CSA produce will not be separated from the market produce and we won’t have your share pre-bagged for you. You will bring your own bag, pick out your produce from the display tables and bag up your own produce. 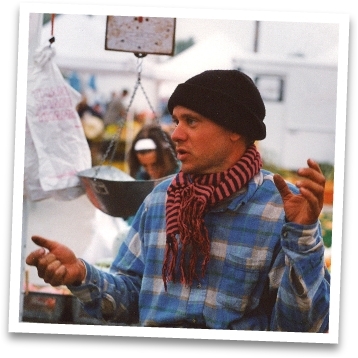 See FAQ #13 and FAQ #14 for what to do if you can’t make it to the market one week. See FAQ #11 for details about the Substitution Policy. Why can’t I choose which vegetables I get each week? How do you choose what to pick each week? First of all, the amount of time and record-keeping it would take in order to allow members to choose the vegetables in their share each week is mind-boggling. Each week I would have to make up a list of available produce and communicate it to you. You would have to respond with your order, and I’d have to make up a master list. If I didn’t have enough of something to give it to everyone who ordered it, I would have to figure out some fair way to make substitutions. Furthermore, I‘d have to run all over the field picking a little of this and a little of that and harvesting would take forever. Then I‘d have to pack each member‘s share up separately. I‘m starting to pull my hair out just thinking about it (in my dreams I still have hair). And all that extra work does not come for free. I would have to dramatically increase the price you pay for the CSA share. The other part of the answer is that the ability to choose which vegetables to pick gives me great control over the quality of the produce you get and the health of my farm. Each week I look over my fields and chose which 7 or 9 vegetables are at their absolute best that week. If the green beans are ready to pick this Tuesday, by next Tuesday they will so stringy and overmature that they won’t be worth picking at all. The spinach that is sweet and succulent on June 1 will be bitter and tough on June 8. The ability to select which vegetables to harvest each week also helps me manage all sorts of problems in the field. For example, say it’s mid-June and the weather forecast is calling for a week of dry, 90- degree weather. I can harvest out the last of my lettuce, radish and other cool weather crops that week for you before the hot, dry weather cuts their eating quality in half. In the fall, you’ll know when the first killing frost is in the forecast because you’ll get lots of peppers, eggplants and other tender vegetables that I’ve rescued from the cold. As an organic farmer, timely harvesting is one of my most important tools for controlling insects, weeds and disease. If the weeds in a carrot bed are starting to flower, for example, I’ll clean out those carrots as fast as possible so I can till down those weeds before they start dropping seeds onto the soil. The best method of controlling weeds is to keep weed seeds out of the soil to start with. If I start seeing swarms of cabbage butterflies fluttering around my cabbage patch, I’ll start harvesting the cabbages even if they aren’t full-size because I know that it won’t be long before voracious green cabbage worms will be feasting on them. In general, when I get to choose, I can run my farm much more efficiently, with much less waste and far fewer pest and weed problems. And again, that in a large part is why my CSA cost less than any other CSA I know off, often as much as half less. And you get to eat produce that is always at its absolute best--even if you aren‘t able to choose what you get. And I am conscientious about putting together a nice eclectic selection each week. I make sure you’ll get a mix of salad crops, root crops, cooking greens, herbs as well as the "fruit" vegetables like peppers, tomatoes, cukes and squash. And I can absolutely guarantee that no two weeks will ever be alike. I just looked back over last year’s list and the greatest number of vegetables that I ever gave twice in a row was four (lettuce, spinach, green onions and radish), and that was early in the season when there isn’t a lot to choose from yet.g. Do we ever have any choice as to what is in our share? Yes, often when you pick up your share you will be able to choose between some items. Usually, I do this for vegetables that I know from past experience that people either love or hate. Cilantro is a great example. People seem to either find it heavenly or disgusting, so the sign on the box might read, “Take one bunch cilantro or one bunch dill” and you get to choose what you want. Another example--some members look forward to geting hot peppers in their share but many members can’t eat them at all. So whenever I bring hot peppers, I always also have sweet peppers to take in their place. Almost every week there will be at least one choice like this in the share. Sometimes, usually in late summer or early fall, I will bring in a whole range of vegetables to choose from. I’ll put up a big sign that says, “Take any 3 items from this table!” and you’ll have a choice of many different vegetables to choice from. Of course, in all honestly, I have never met a vegetable that I didn’t like. Show me a vegetable you don’t like and I believe that between me, Hiroko, my sisters, my mother and mother-in-law, we can find a way to fix it that you will like. And you will find some of those recipes in each week’s Food and Farm Notes. 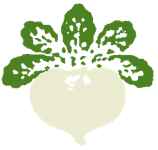 On top of that you have our Henry’s CSA Recipe Book and the searchable archive of recipes on our website. Finally, it is always a good idea to re-try those things that you “know” you don’t like. You may not like broccoli because your first experience was with those pale-green, rubbery stalks of overcooked broccoli served in the school cafeteria. Try the real thing--you may be delighted to find out what you have been missing. Finally, the Exchange Table gives you some choice as well. See the next FAQ for how it works. Although I choose the 7 to 9 vegetables that make up your share, I try to give you some say in the matter by having the Exchange Table. The Exchange Table is the place where you can exchange the vegetables that you just can’t eat for something that you can. The way it works is that I prime the table with some extras of the vegetables in your share that week. The way it works is this. First, go down the line picking up your share, taking each item available that week even if it includes something that you have absolutely no intention of taking home and eating. When you get to the end of the line, put anything that you don’t want on the Exchange Table and take what you want instead from what is there. Don’t be shy about using the Exchange Table. Chances are that somebody else loves precisely what you loathe. This fact was driven home just this spring when a member requested that I grow fewer beets this year. The very next day I ran into another member who said, "I sure hope you’re raising more beets this year." Also make sure you pick up every item in your share and don’t skip over those things you don’t want. No beet-lovers will be able to grab up your beets unless you have carried them down to the Exchange Table. If everybody uses the Exchange Table properly, no one should ever have to eat something that they don’t like. What happens to produce left over on the Exchange Table or left over from members who didn’t come to pick up that week? It depends on how much is left. If there is just a small amount left on the Exchange Table, I divide it up amongst my extended family and we eat it or put it up for the winter. If there is more left over than we can possibly use, I feed it to the chickens or put it on the compost pile. No organic matter ever goes to waste on this farm. Either somebody eats it or it is recycled back into the soil. 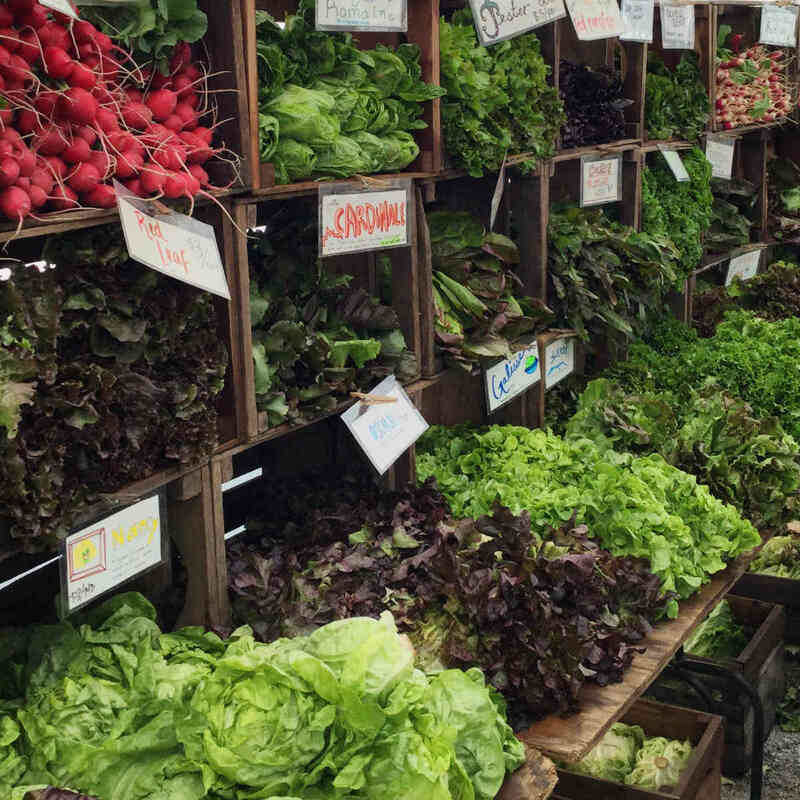 How does the Substitution Policy for the Evanston Farmers Market CSA work? Since we don’t have an Exchange Table at the Farmers Market pick-up, I allow members to substitute up to three items in the share each week for items of their choice. In other words, to use the same August sample share above, let’s say that you don’t like beets, are growing your own basil and are tired of cucumbers. You can substitute something else for all three of those things. However, you must substitute like for like, both in terms of the type of vegetable and its value. For instance, you must substitute a root crop for a different root crop, a green for another green, an herb for another herb, etc. So you could grab a bunch of carrots instead of the beets or a bunch of cilantro instead of the basil. Most things in the stand cost $3, so matching value is usually not difficult. A cucumber, though, usually only costs a $1 or $1.50, so you’d grab something of similar value, like an extra couple ears of corn, a quarter pound of green beans, a big green pepper, etc. For my record-keeping needs (and personal curiosity), please let me know if you are making substitutions and what they are. This substitution policy gives you a huge amount of latitude in tailoring your CSA share to your personal tastes and needs. What if I get vegetables, like tomatillos or daikon radish, that I have no idea how to cook or eat? Almost every new CSA members is introduced to some vegetables that are completely unfamiliar. To help out, my sister Terra publishes an e-flyer each week that lists what vegetables you’ll get that week and gives simple-to-make and delicious-to-eat recipes for them, particularly vegetables that aren’t traditional central Illinois fare. We try to get it out to you early enough to give you a little heads-up on what you’ll find at the pick-up. My goal is to get the flyer out on Monday evening, but Tuesday morning is probably a more realistic prospect. Furthermore, all new members receive the recipe booklet that Terra put together. It covers (almost) every vegetable I grow from arugula to zucchini and features all the favorites from past flyers. There is also lots of information about putting up extra produce for the winter. What if something comes up and I can’t pick up my vegetables or I just forget one week? I realize that things do come up and people do forget. (Heaven knows I do.) Depending on your pick up location, you have some options for getting your share. All downstate CSA members: You can call to arrange to pick up your missed share at the farm the next day. You must call me before 12 noon on Wednesday. If we don’t hear from you by then, I’ll assume you aren’t going to pick up. Bloomington/Normal and Evanston members have another option. You can pick up a double share at the subsequent regular pick up. I ask Bloomington/Normal members picking up a double share to come during the last 15 minutes of the pick-up period, so I can be sure that there is enough produce left over for you to get your extra share. Eureka, Morton and Peoria members: You can call the coordinator for your pick up site and ask if they will hold your share until you can pick it up. It is entirely up to the coordinator as to whether they can honor your request or not. Please respect the privacy of our volunteer coordinators. What should I do if know ahead of time that I won’t be able to pick up my vegetables one week due to work travel, vacation, conflicting schedules, etc? The best thing to do is arrange for a friend, neighbor or family member to pick up your vegetables for you. Just tell them to give me your name when they come to pick up your vegetables. For other options, please see FAQ #13. If I notify you well beforehand, can I get a refund for those weeks that I will be out of town during the season? I cannot refund members for missed weeks. The reason is that even if I know that I don’t have to pick for you, I cannot tell the vegetables not to grow that week. The vegetables will be there that week whether you are in town or not and I cannot afford to not be paid for them. I cannot afford not to be recompensed for the hours and hours of labor and love that have already gone into growing them. The fact that everything I grow for the CSA is paid for up front and in full is one of the major reasons why I can provide fresh, organic vegetables to CSA members at or below what you would pay for chemically-raised produce in local stores. Nothing goes to waste and every minute of work in the field is paid for. Why do I have to pay for the whole season up front? Why can’t I just pay week by week throughout the season? The reason that I have members pay up front is that I need to know in the spring how many people I will be feeding in the summer and fall months. When I plant the first broccoli and pepper seeds in the greenhouse in early March, I need to know how many broccoli and pepper plants I need to grow this year and the only way I can know that is to know how many members I have. The other reason I like payment up front and in full is that it shows that you have made a hard and fast commitment to me and the CSA. My commitment to you begins when the first seeds go in the ground in early spring. If members could pay as they go, some members would drop out as the season progressed just due to the law of entropy. Members would drop out in late August, for example, as life becomes hectic when the kids go back to school. Unfortunately, I would have already invested months of time and work and money to grow that member’s food for September and October. Finally, if I had to spend time keeping track of who paid what and when, I would never have time to actually raise the vegetables. I don’t think I can use a full share. Do you have half shares? No, I only offer full shares. If you don’t think you can use a whole share, I would encourage you to join up with a friend, family member or neighbor to share with. I have many members who do this. Some of them divide up each week’s produce while others alternate who picks up every other week. Sharing is also a good idea if you think you might miss a lot of pick-up days because of travel, work or kids’ activities, because your share partner can pick up for you when you cannot. What do you mean when you say you farm organically? My farm and therefore everything I grow on it is 100% USDA certified organic. What that means is that I follow all of the USDA standards for organic production and that I undergo an inspection every year to certify that I am indeed following the rules. So what are the standards? At their most basic, they state that an organic farmer must not use or have used for the previous three years any synthetic chemicals of any kind on one’s farm. That means no man-made insecticides, herbicides or fungicides. A certified organic farmer can kill no organisms with manmade chemicals whether viruses, bacteria, weeds or insects; even rat poison is banned. To be certified organic, one must use no synthetic fertilizers, no hormones, no sewage sludge and no genetically modified organisms of any kind. I have been growing vegetables organically since I helped in my parents’ gardens as a young child, and I have been farming organically for my entire farming career. So, I didn’t convert to organic farming. It is all I have ever known. I learned it from my parents and put that knowledge to work when I started out in my first year farming in 1993. In all those years, I have never raised food in any way that couldn’t be certified organic under the USDA rules. But for me, a true definition of organic goes beyond a list of rules, a list of do’s and don’ts. Organic farming is a philosophy and a way of life. Since organic food has become big business over the past decade or so, many farms, particularly corporate farms, are going organic for purely economic reasons. To them, the organic standards are simply a series of hoops to jump through in order to get their fingers on a piece of the organic pie—and organic premium prices. To me, farming organically means farming in a way that is harmonious with Nature. It means realizing that Nature is the true expert farmer. An ecosystem is a master farmer, producing abundant food for all the living beings within it. Nature produces food for each organism without harming the environment for other organisms. My goal as an organic farmer is to learn enough about Nature and through Nature to be able to produce food for humans without despoiling and destroying the environment for all other living things. I still have a lot to learn. Farmers should be able to raise food without polluting the air and water, without degrading the health and fertility of the soil, without destroying biodiversity and without leaving our children a less healthy planet. This statement is self-evident and no farmer, no consumer would argue over its validity. In practice, however, it is a radical notion, for most of our agriculture today does, in fact, pollute the air and water, degrade the soil, destroy biodiversity and leave the planet a less hospitable place for future generations. I see it my duty as a farmer to fight this trend. In short, I’d rather have you rather than the USDA decide whether I am “organic” (or natural or sustainable) enough for you. I encourage you to ask me questions about my farming practices and philosophy. You are welcome to come to my farm anytime. You can do your own inspection and conduct your own certification process. So that is the short answer. To give a complete answer to what farming organically really means, I would have to write a book. Wait a minute. Come to think of it, I already have. My booklet “Organic Matters” gives a fuller answer to the question of what I think organic farming is. You can read excerpts from it on this website or order the complete essay by emailing my sister Terra. And speaking of Terra, she has written her own book about organic farming on Henry’s Farm. It is called “The Seasons of Henry’s Farm” and can also be ordered by emailing her. Will our vegetables be full of bugs because you farm without chemicals? Full of bugs? No. Will you ever find an insect on your produce? Yes. You might find a corn earworm on the tip of your sweet corn one week for instance, or a cabbage worm in your broccoli now and again. But it will be rare. My philosophy is live and let live. I know some people are so squeamish that if they see a bug on a vegetable, they’ll throw the whole thing out rather than eat it, but I think that is silly and wasteful. Look at it this way. Say you have an earworm on your corn. Earworms come in at the tip of the ear and they eat the silks and the kernels at the very end of the ear. Now all you have to do take a knife, flick out the worm and cut off the tip of the ear. Voila! You have a perfectly good ear of corn. The other alternative is to spray the corn with a toxin that will kill all the earworms in the field (and other life as well). As someone once said to me, "Would you rather have a worm that you can see or a poisonous chemical that you can’t?" Besides earworms and cabbage worms, few insects are dumb enough or slow enough to stick around after a vegetable is picked. Sometimes you will see the telltale signs of where insects have eaten a little of your produce before you got to it. Often the greens will have little holes in the leaves where flea beetles were munching or the beans will have some gnaw marks from bean beetles, but I see nothing wrong with sharing a little of our food with our insect brethren. Sometimes insects can feed so heavily on a crop that it’s no longer worth it to harvest or try to eat, but if the damage is only cosmetic I will go ahead and harvest and sell a crop with a little insect damage. I certainly won’t go out with insecticides (even organic insecticides) just to ensure the cosmetic beauty of a crop. Do you ever supplement your produce by buying certified organic produce on the wholesale market and reselling it? Absolutely not. First of all, most produce on the wholesale market doesn’t meet my standards for quality, taste or sustainability. More importantly, however, I would never sell you produce about which I know nothing. I am not a merchant; I am a farmer. That said, I do sometimes ask two neighboring certified organic farmers (Larry and Marilyn Wettstein and Dennis and Emily Wettstein) to grow sweet corn and green beans for the CSA to supplement my own supply. Sweet corn takes up a lot of field space and I just don’t have enough room to grow enough to satisfy the demand and beans take so much time to pick that I can rarely get enough to give to all members. I have known both of the Wettstein families for years and trust them as much as I trust myself. Both farms are certified organic and have been so at least as long as my farm. Yes, everybody is welcome. As we like to say, “Our Farm is Your Backyard Garden.” Please come for a walk in your “backyard away from home!” The best days for visits are Monday through Wednesday but don’t come out on Tuesday mornings unless you plan to help us pick the produce for your share that week. Arrange with me by email or cell phone to come out. Kids of any age are welcome. I will try to find time to show you around a little, but mainly it will be a self-guided tour. You are welcome to wander around at your leisure. We have two annual events on the farm. In the spring, we host an Orientation Meeting/Farm Tour for all new CSA members, where we tour the farm and also address and answer questions about how the CSA works. We serve drinks and snacks. In the fall, we have a potluck/farm tour to which all farmers market customers and CSA member families are invited, tentatively scheduled for the first Saturday in October. In addition to the potluck and guided tours of the farm, we have a Veggie Quiz with prizes for winners, a Corn Maze for kids, a bonfire at dusk and live music. Geology isn't quite destiny, but it's close. 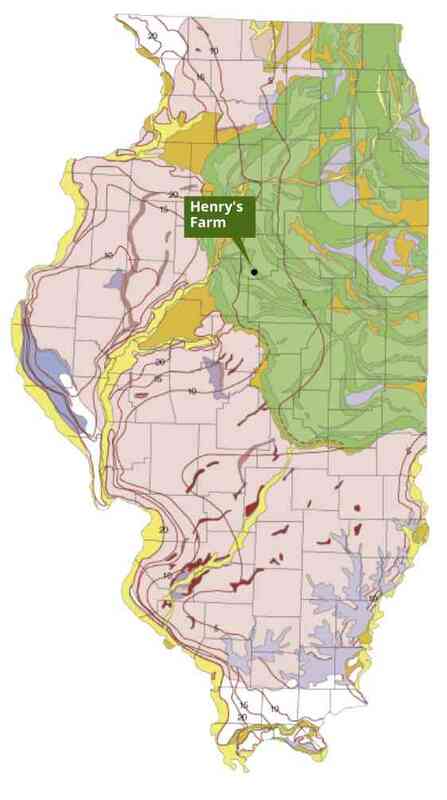 Farming Henry’s way on Henry’s land has been made easier by its geological history. Many thanks to Dr. Kris Huysken, Department of Geosciences, Indiana University Northwest for providing information used in this short synopsis. Deep wells provide the water for all of the people and animals on Henry’s Farm. They also provide water for transplants, and during the rare times when irrigation is necessary to germinate seeds or keep plants going through droughts. These deep wells are made possible by the aquifer under Illinois formed 570 to 250 million years ago when Illinois was covered by shallow seas (and located near the equator!). The sediments deposited in these seas later turned into the alternating shallow sedimentary strata of limestone, shale and sandstone. Sandstone provides excellent water quality: Small pores between grains of sand allow water to slowly move through the rock while filtering out impurities. Flat land is much easier to farm using industrial methods than hilly land. And Henry’s Farm is hilly, thanks to glaciers that, from 1,500,000 to 10,000 years ago created ridges and plains as they repeatedly advanced to the south, paused creating a ridge at its edge, and retreated. In the map of Illinois to the left the green area shows alternating bands of ridges (darker) and plains (lighter) left from glacial activity during the Wisconsin Episode. Henry's Farm on one of the ridges. The soil on Henry's Farm is extremely fertile: a key factor in the taste and level of nutrition of the vegetables he grows and brings to market. 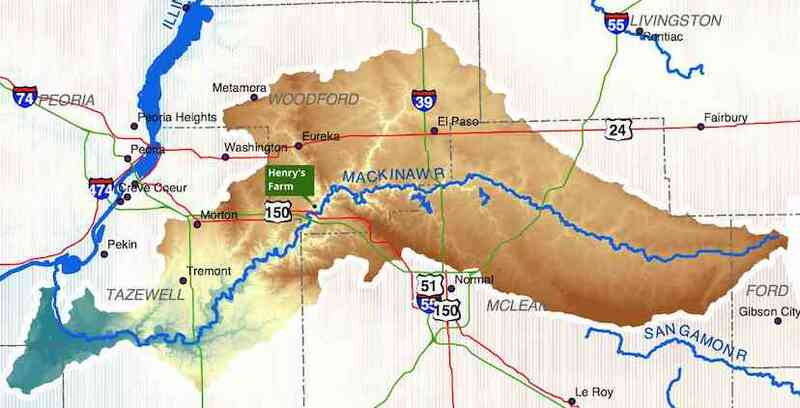 When Henry began farming here, he was blessed with rich deep soil because the farm is along Walnut Creek in the Mackinaw River Valley, where periodic flooding has deposited nutrient-rich silt creating richer and richer soil for 10,000 years. The millennia of soil deposits have created topsoil so deep that Henry's never reached the bottom of it, even when digging down five feet to loosen the burdock roots. Henry works hard to replace nutrients removed from the soil in the form of vegetables taken to market. He continually enhances the fertility of the soil by growing cover crops, rotating crops, returning all plant organic matter to the soil, and leaving fields fallow. Henry made the decision to make organic farming his life’s work while still in Japan. That’s where he met his wife, Hiroko, where they were married, and where, in 1990, their first child was born. When they came back to the U.S. they lived for a year in New York State where they apprenticed with John Gorzynski, who grows organic vegetables for New York City’s flagship Green Market in Union Square. Henry was uncertain as to where his farming future would be. Then one day, on a trip to visit the family back in Congerville, Henry had an epiphany. He stuck a shovel into the earth, just as he had been doing in New York, and turned it over. For a long moment, he stared at the incredibly rich, black, loamy earth. That was it. He knew that this was where he had to be; this was the land he would farm. And that’s what Henry has been doing since 1993, building the soil, planting hundreds of kinds of vegetables, and enriching the lives of every person who eats them. Along the way he has spoken at many winter farming conferences, and won many awards, including the R.J. Vollmer Sustainable Agriculture Award and the prestigious USDA Sustainable Agriculture Research and Education Patrick Madden Award. This is a small and very diverse farm. At larger farms or farms that specialize in fewer products, apprentices often get stuck doing pretty much the same thing day in and day out. Not here. You will never be stuck hoeing carrots for eight hours or picking tomatoes every day for a week. Every day is different. Another advantage at this farm is that the apprentice is my right hand. Assorted members of my three-generational family help out on harvest days and other major jobs, but day in and day out it is just me and the apprentices trying to keep up with ten acres of vegetables. Interns will take part in every aspect of small-scale, sustainable vegetable production, including raising transplants, planting, weeding, mulching, trellising, harvesting and marketing. Interns will leave the farm with a good grasp of the skills and knowledge needed to start their own farms. Henry's farmhand Mike Mustard created "Hanging at Henry's," a 33-part weekly video blog that provides both a drone’s eye view and an in-depth look at how Henry's Farm works, and what interns and farmhands do throughout the season. If you want to get a real feel for the place and the job, dive into these! In the episode we feature here, Mike interviews Henry's mentor John Gorzinski (pictured below with Mike Mustard at the NYC Union Square Green Market), as well as Henry's intern Evan Barry as he completes a year on Henry's Farm and prepares to start his own farm. Three other posts that stand out are The Great Garlic Harvest, Making Hay While the Sun Shines, and Early Season Greenhouse Work. The basic categories of work are planting and transplanting, weeding, mulching, harvesting and selling. Almost all of the work is done by hand or with hand tools. I have one small tractor for tilling, making beds and some cultivation. A day on the farm is long, hot and hard—full of sweat, pain and bugs. I love it. But most people don't. I once had someone quit after three hours and never come back. I have also had apprentices who decided to stay on for another year. One former apprentice stayed on as my farmhand and has been here for over 12 years now. A season on the farm should feel like time spent in a foreign country. It should feel like a completely new environment. You will make the shift from a consumer of food to a producer of food. There is so much to learn, to observe, to absorb. There are the details, a rainshower of details—how to wield a hoe, how big to make a bunch of carrots, how far apart to thin the lettuce, how thick to lay the mulch, which is the tatsoi and which is the mei qing choi. The details, while overwhelming in sheer number, are relatively easy to learn and easy to teach. Then there is the overall picture. The overall picture is harder to grasp and perhaps impossible to teach. Understanding the overall picture means having a feel for the weather, the seasons, the soil, the landscape. It means having a feel for the way nature works. Actually, I don't know what understanding the overall picture means. It is impossible to explain. The only way I know to learn about it is to become part of it. When you wake up with birds singing in the predawn and go to bed when it gets dark; when you are exposed day-long to the elements; when you are wet when it rains, oily with sweat when it is hot, shivering when it is cold; when your hands are stained with soil; when you eat what you grow—when you feel the days get longer and longer and then shorter and shorter—then you start to get a feel for the overall picture. A season on the farm should feel like time spent in a foreign country. It should feel like a completely new environment. You will make the shift from a consumer of food to a producer of food. There is so much to learn, to observe, to absorb. There are the details, a rainshower of details--how to wield a hoe, how big to make a bunch of carrots, how far apart to thin the lettuce, how thick to lay the mulch, which is the tatsoi and which is the mei qing choi. The details, while overwhelming in sheer number, are relatively easy to learn and easy to teach. Then there is the overall picture. The overall picture is harder to grasp and perhaps impossible to teach. Understanding the overall picture means having a feel for the weather, the seasons, the soil, the landscape. It means having a feel for the way nature works. Actually, I don't know what understanding the overall picture means. It is impossible to explain. The only way I know to learn about it is to become part of it. When you wake up with birds singing in the predawn and go to bed when it gets dark; when you are exposed day-long to the elements; when you are wet when it rains, oily with sweat when it is hot, shivering when it is cold; when your hands are stained with soil; when you eat what you grow--when you feel the days get longer and longer and then shorter and shorter--then you start to get a feel for the overall picture. My idea of the ideal relationship between an apprentice and farmer is one where the apprentice asks the farmer as many questions as they have. Why do you do it this way? What happens if you do it this way instead? What happens next? Just as important as asking questions, however, is watching the farmer closely and trying to learn as much as possible just from observing him. You will be doing new and different tasks almost every day for the entire time you are here. I, on the other hand, will be doing tasks that I have done so many times that they are (sometimes) second nature to me. If the way I do something doesn't make sense to you, ask me about it. Chances are that I have a reason for doing it that way (although sometimes it is hard for me to remember what the reason was). The other thing that you as an apprentice should be trying to learn is whether the farming life is for you. I can't help you there except by giving you the total immersion experience. By the time you leave here, you will have become an integral part of this farm. The apprentice's day runs from 6 in the morning until 6 in the evening, with a 2-hour break for lunch and rest during the hottest part of the day. The big harvest day. We start at daybreak and stop when everything is picked, with only a short break for lunch. Market day in Evanston. We leave the farm at around 1 in the morning and return around 5:30 p.m.
Saturday and Sunday, unless you helped out at the market on Saturday, in which case you get Sunday and Monday off. Apprentices are provided with free lodging in a 14 x 60 foot mobile home located on the farm. The home has a full kitchen, bathroom, living room and three bedrooms. You will share the home with the other apprentices. The apprenticeship is meant to be a learning and training experience, not a job. As such, you won't be paid wages. You will receive a stipend every week, which should cover your living expenses while you are here. Housing is free (you won’t pay for rent, utilities, repairs, etc.) and your food bill should be next to nothing as you’ll get all the vegetables you can eat as well as any fruit, meat, grains and eggs that we grow for our own use. No smoking or drinking during work hours or break times. You are expected to work as hard and fast as you can all the time. Everybody on the farm (from our youngest apprentice to our 80-year-old parents to the family dog) works as hard as they are able. Come to our stand at the Saturday morning Downtown Evanston Farmer's Market on Saturday mornings. It's at the northwest corner of the market by the Metra tracks. Early in the season Teresa's stand is right next door.